Life on Earth depends in some way or the other on carbon fixation, which is the ability of algae, plants, and some bacteria to “pump” carbon dioxide (CO2) from the atmosphere, add solar or other energy, and convert it into the sugars that are the required starting point crucial for life processes. In the biological sense, humans are heterotrophs as the food they eat begins from carbon fixation processes of nonhuman producers. Can an organism belonging to the top end of the food chain, which uses sugar and discharges CO2, be “reprogrammed” in such a way that it uses CO2 from the atmosphere and generates sugars it requires to erect its body mass. The research team from Weizmann Institute of Science was able to achieve this feat recently. The team was headed by Dr. Niv Antonovsky, in Prof. Ron Milo’s lab at the Institute’s Plant and Environmental Sciences Department. He states that the ability to optimize carbon fixation is vital for enhancing human being’s ability to handle challenges, such as the requirement to provide food supply to an ever increasing population on decreasing land resources and at the same time utilizing minimal fossil fuel. The Weizmann team took up the challenge by placing the metabolic pathway for carbon fixation and sugar production into the bacterium E. coli that consumes sugar and discharges CO2. Carbon fixation’s metabolic pathway is well established, Milo and his team believed that with adequate preparation, they would be able to affix genes possessing the data for building it into the genome’s bacterium. 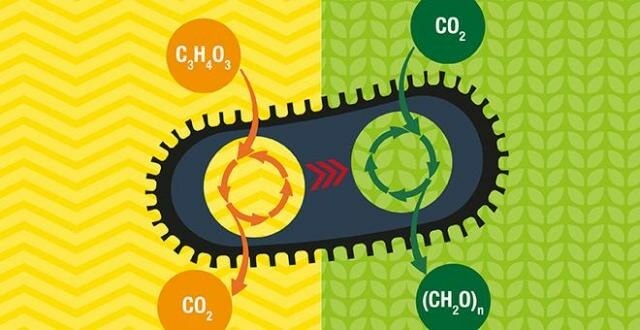 So far, RuBisCO, the main enzyme applied in plants to fix carbon, uses as a substrate for the CO2 fixation process a metabolite which is lethal for the bacterial cells. Therefore, it was important for the design to include accurately regulating expression levels of the mixture of genes across this multistep network. The team’s design was quite successful in one phase – the bacteria were able to create the carbon fixation enzymes, and these were usable. However, the downside was that the machinery was not able to “supply the goods.” Although the carbon fixation mechanism was expressed, the bacteria could not make use of CO2 for sugar production, but instead depended on the supply of sugar from outside. Antonovsky, Milo and the team, including Shmuel Gleizer, Arren Bar-Even, Yehudit Zohar, Elad Herz and others, subsequently designed tanks termed as “chemostats.” Here they grew the bacteria, steadily nudging them into forming a craving for CO2. At first, the bacteria in the tanks along with plenty of CO2 bubbles were provided a large quantity of pyruvate, which is an energy source, as well as scarcely adequate sugar to stay alive. By altering the conditions of their surroundings and stressing them, the researchers forced the bacteria to adapt and use the more plentiful material in their surroundings. Things remained quite static for over a month. The bacteria began showing signs that more was happening than “just survival” by the one and a half months. The team noticed that by the third month, they could wean the bacteria away from the sugar and cause them to thrive on CO2 and pyruvate alone. Isotope labeling of the CO2 molecules showed that the bacteria were indeed using CO2 to generate an important portion of their body mass, including all of the sugars required to build the cell. When the researchers sequenced the genomes of the newly formed bacteria, they discovered several modifications spread across the bacterial chromosomes. They were completely different from what we had predicted. It took us two years of hard work to understand which of these are essential and to unravel the ‘logic’ involved in their evolution. The ability to program or reengineer E. coli to fix carbon could give researchers a new toolbox for studying and improving this basic process. The team continued to repeat this process, which gave them crucial clues for detecting the mutations needed for altering the E. coli diet from one relying on sugar to one relying on using CO2. Despite the fact that CO2 is currently discharged back into the atmosphere by the bacteria, the team hopes that their findings might be used in the future for producing microorganisms that have the potential to soak up atmospheric CO2 and then transform it into stored energy or for obtaining crops containing carbon fixing pathways, thus resulting in increased yields and improved adaption to feeding humanity. Prof. Ron Milo's research is supported by the Mary and Tom Beck-Canadian Center for Alternative Energy Research; the Lerner Family Plant Science Research Endowment Fund; the Leona M. and Harry B. Helmsley Charitable Trust; Dana and Yossie Hollander, Israel; the Larson Charitable Foundation; and the Wolfson Family Charitable Trust. Prof. Milo is the incumbent of the Charles and Louise Gartner Professorial Chair.